Andre Russell starred with a four-wicket haul as Kolkata Knight Riders restricted Kings XI Punjab to 157 for nine and overcame a knock of 68 runs from Glenn Maxwell in a chase of 165 runs to secure a seven-run victory in the 32nd match of the Indian Premier League in Kolkata. Kolkata Knight Riders’ total was set up by a mammoth opening stand of 101 runs between Robin Uthappa and Gautam Gambhir, who slammed fifties to continue their sublime form in the tournament. After winning the toss, Kings XI Punjab decided to bowl first. 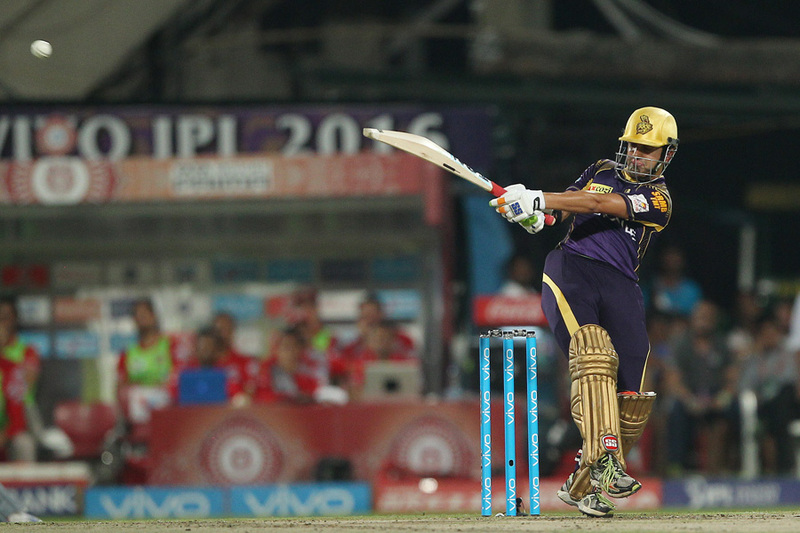 Gambhir (54) began well with four boundaries in the first three overs. Along with Uthappa (70), the Kolkata Knight Riders skipper, pushed the score to 40 for naught in the powerplay. The pair kept scoring at a steady pace but never too many risks as they went on to add 74 runs in 10 overs. Gambhir was the first one to reach his fifty in the 13th with a boundary. However, the left-hander was run out in the very next over as he was backing up too far at the non-striker’s end. Moments later, Uthappa completed a 38-ball fifty and was dropped in the very next delivery. Taking advantage of the reprieve, Uthappa smashed a six and a four in the 15th over, taking the score to 121 for one with five overs left in the innings. In the 17th over, Uthappa was run out at the non-striker’s end. Cameos from Russell (16) and Yusuf Pathan (19 not out) helped Kolkata Knight Riders score 164 for three despite facing some tight bowling in the death overs. Russell was run out in the last delivery making it only the second time in T20 cricket where a team lost more than two wickets with all the batsmen being run out. Russell (4-20) began the innings by having Marcus Stoinis (0) caught at mid-off in the very first over and followed it up with the wicket of Manan Vohra (0) in the third. In the next ball, Morne Morkel (1-27) forced Murali Vijay (6) to miscue a shot to mid-off. However, Maxwell (68) and Wriddhiman Saha (24) struck a couple of boundaries each to take the score to 37 for three in six overs. In his very first over, Piyush Chawla (2-27) castled Saha as Kings XI Punjab were restricted to 64 for four at the halfway mark. Maxwell smashed two sixes and three fours in the next two overs, reaching a 29-ball fifty in the process. Maxwell continued to take calculated risks and brought down the equation to 48 runs required from 30 balls. In the 16th over, Maxwell tried to reverse sweep Chawla but was trapped lbw, ending the crucial 67-run stand for the fifthh wicket. David Miller’s (13) 18-ball knock was ended when he holed out to long on off a full toss from Russell. However, Axar Patel (21) smashed two sixes in the over, bringing the equation down to 22 needed from 12 balls. Gurkeerat Singh Mann (11) and Patel scored 10 runs from the penultimate over. Kings XI Punjab succumbed to the pressure and lost the wickets of Patel, Gurkeerat and Swapnil Singh (0) in the final over and fell short of the target by eight runs. Russell finished as the best bowler with four wickets and fetched the man of the match award. This seven-run victory took Kolkata Knight Riders to the top of the points table while Kings XI Punjab continue to stay at the bottom.